I had to revamp my weekly menu plan due to bad weather which kept us away from the grocery store yesterday. 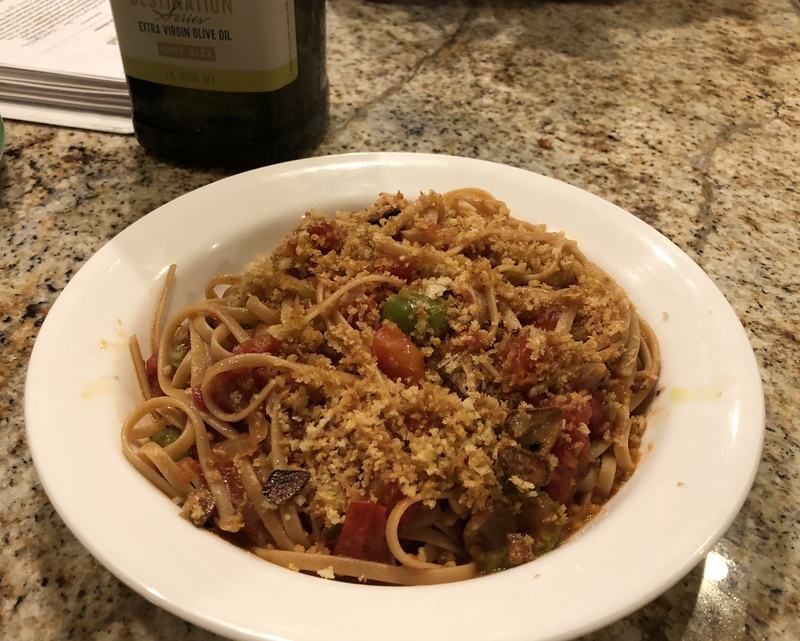 Luckily I always have the ingredients in my pantry for my Italian vegan dinner, whole wheat linguine in a sauce of tomatoes, garlic, onions, and capers garnished with toasted breadcrumbs. This dinner is so quick and easy. While the water is coming to a boil I toast some garlic slices and then use that garlic flavored oil to toast the panko breadcrumbs. I set both of those aside for garnishing and after adding a bit more olive oil to the pan I toss in some chopped onions. At this point the pasta goes into the boiling water. When the onions are translucent in goes a can of petite diced tomatoes, some capers, olives, pepper flakes, and maybe some fresh or dried herb. When the pasta is al dente toss it into the sauce along with some pasta water if needed. Stir it around and serve it up with the toasted breadcrumbs and garlic. John also likes to add some finishing oil and Parmesan cheese but I think that is gilding the lily. This entry was posted in Easy, Italian, Kitchen tips, Pasta, Recipes, Vegan, Vegetables, Vegetarian and tagged olives, pasta, tonatoes, Vegan. Bookmark the permalink.